Despite the horribly insane traffic last night (since when is downtown LA on a Saturday night the best place and time for a 5k run? 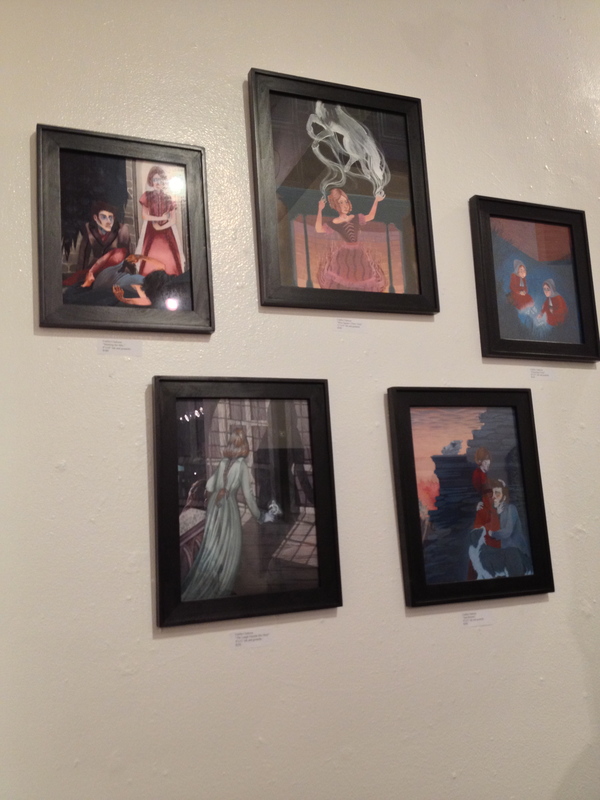 ), I made it to my show opening! Mad props to my BFF Sophia for driving the whole way, only to have to turn back without seeing the show when she couldn’t find parking. It was seriously that crazy. But here are the pieces, and some of the story that goes with them. 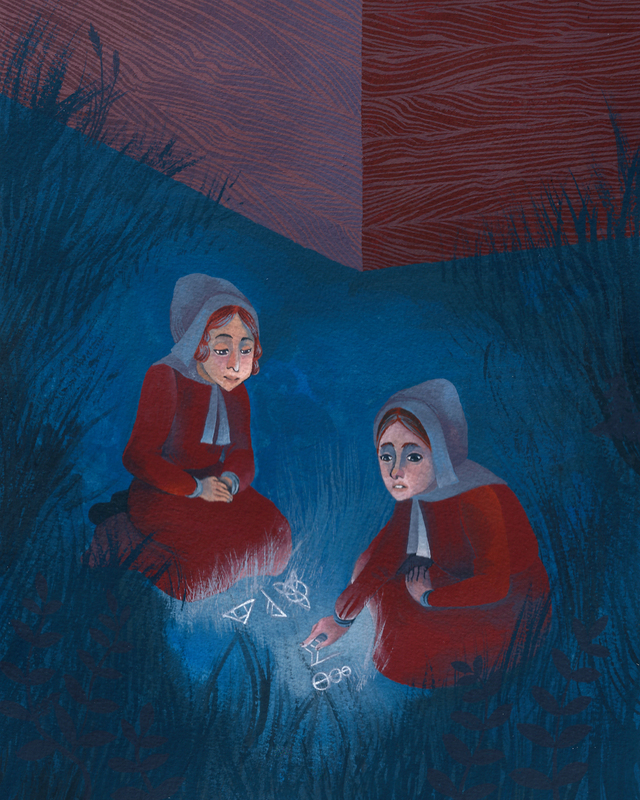 A young Jane Eyre is taught basic spells by her only friend, Helen Burns. 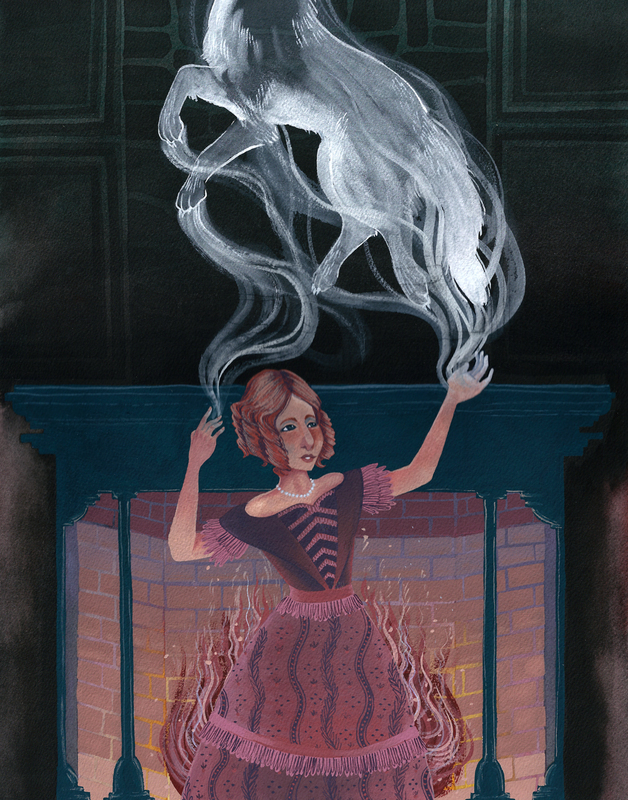 It is this basic knowledge of witchcraft that helps her secure a job as a governess at Thornfield Hall. She teaches Adele, daughter of a Mr Rochester. 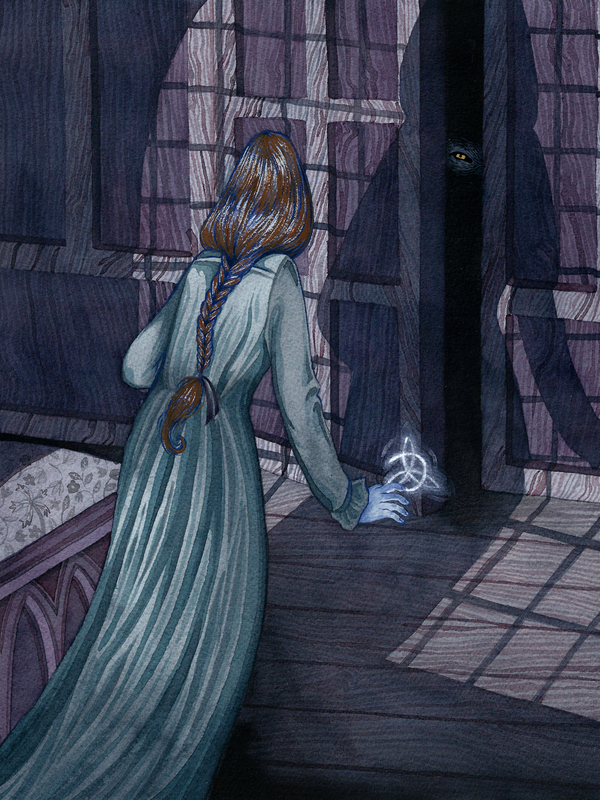 One night, Jane wakes to the sound of laughter and scratching at her door. She believes it to be Mr Rochester’s dog, Pilot, but she casts a spell of protection just in case. Despite the mysterious sounds and happenings, Mr. Rochester invites some of his friends to stay at Thornfield. One of them is a Ms Blanche Ingram; Ms Ingram is a far more knowledgeable sorceress than Jane, and seems to be an expert on werewolves. Jane is dismayed to see how much interest Mr Rochester seems to take in her. But Jane is mistaken- Mr Rochester has fallen in love with her, not Blanche! They quickly decide to wed. Their happiness does not last long, however, for on the day of their nuptials, it is revealed that Mr Rochester is not only married, but that his wife still lives! Heartbroken, Mr Rochester explains that as a young man, he married Bertha Mason; to his dismay, he quickly discovered that she is a werewolf. Trapped in a lie, Mr Rochester kept Bertha hidden in a remote tower of Thornfield Hall. Unable to live with the man she loves but cannot wed, Jane flees Thornfield. She attempts to make a new life for herself as a school teacher, but can’t help but be drawn back to Mr Rochester. 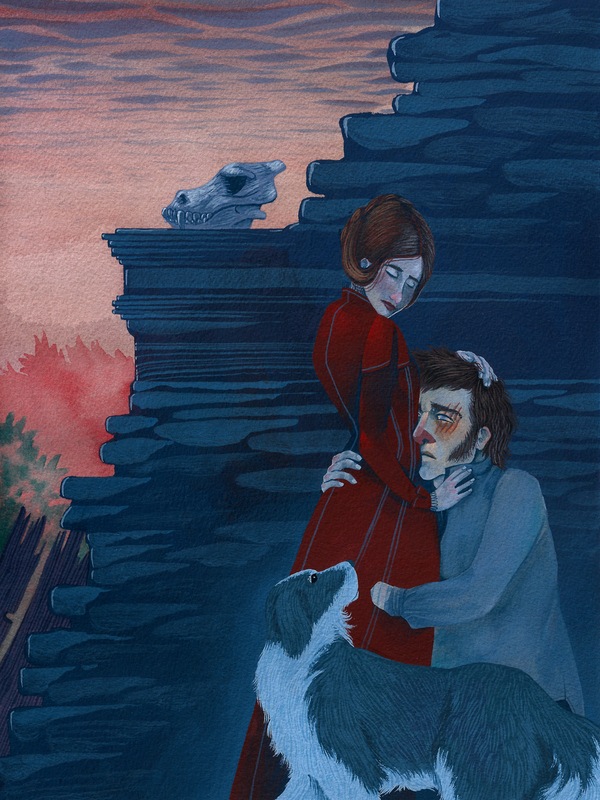 She returns to a destroyed manor and a scarred Mr Rochester. But Bertha is gone, and the two lovers are able to rebuild and start anew. And here’s how they looked all hung together! Once again, kudos to Sophia- we came up with the story by just spitballing while watching Jane Eyre (the 2011 Cary Fukunaga version). 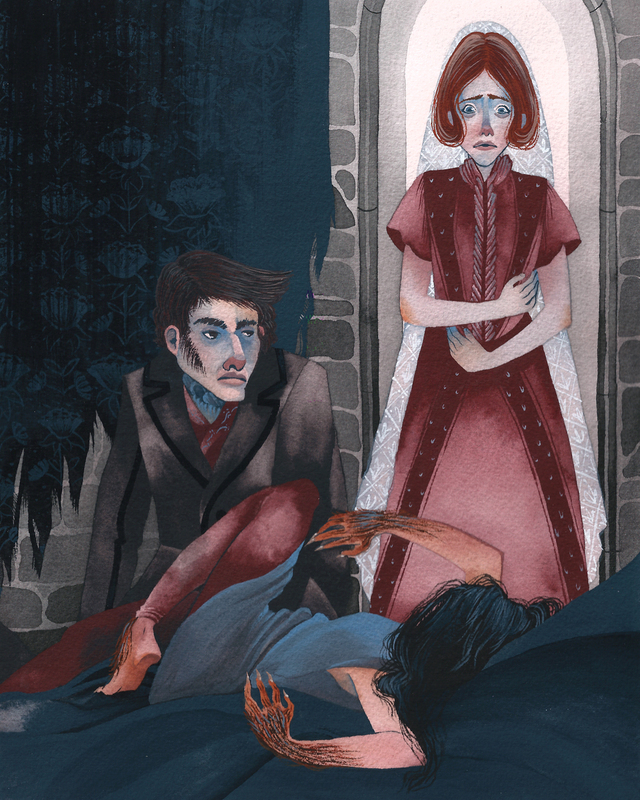 Gorgeous literary reinvention and sumptuous illustration. Wonderful!